I found a copy of the movie Hardbodies in the bargain bin last week and remembered it was a bad movie for acting and plot, but we loved it when it came out in the Infantry because it had a lot of pretty girls in swimsuits. And then it struck me that this was more than 3o years ago. The 90's were just 3 or 4 years ago? What happened to my 80's? Hardbodies, that's the one about converting pewter miniatures right? Nope- not even that much plot! Basically a lot of shots of a beach in California, young guy tries to teach old guys how to pick up chicks (who are so vapid and desperate that they fall for it)- typically early 80's T&A flick. _Very_ popular with a barracks full of GI's with the 'just got out of prison' haircut at a base near a small town that hates them. Closest most of us ever got to a pretty girl was the TV screen, and 'VCRs' were the newest thing! Hard bodies is a classic up there with Hot Resort and Bikini Carwash Company 2. Bob! My long lost movie-brother! Spring Break also. So... just out of curiosity, any way to improve the BS of a fortification? Stragies, psychics, orders, whatever? I've decided Games Workshop rules are like the weather in New England - if you don't like them, just wait a little while, they'll change. Speaking of old time, there was a time when I thought it worth the trouble to memorize them all. Now that the frame is done I have plans for it, BIG plans. Call it a couple of different fortifications "on the same base"...? 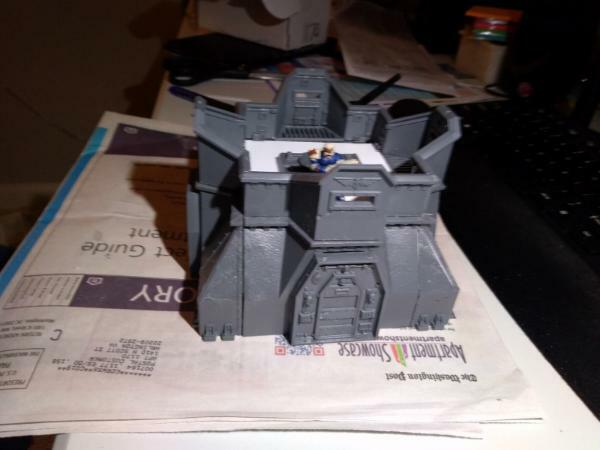 Little bunker is more or less done. And biggie is waiting for a shapeways order. Biggie's not glued yet but more or less fits, I may have to squeeze some green stuff into the gaps. 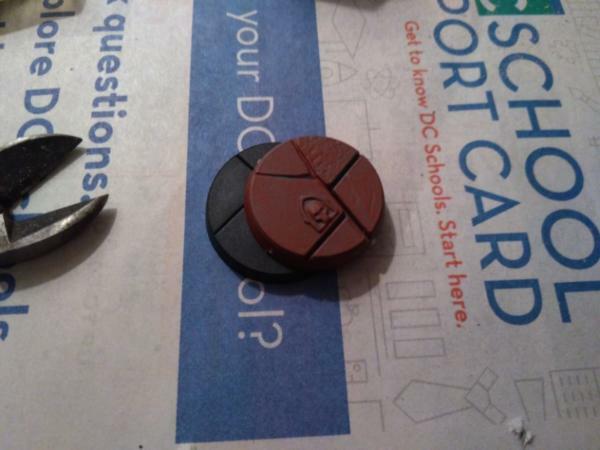 The way you dealt with the gap between the two pieces is great! It really looks like it was an intended component of the kit. 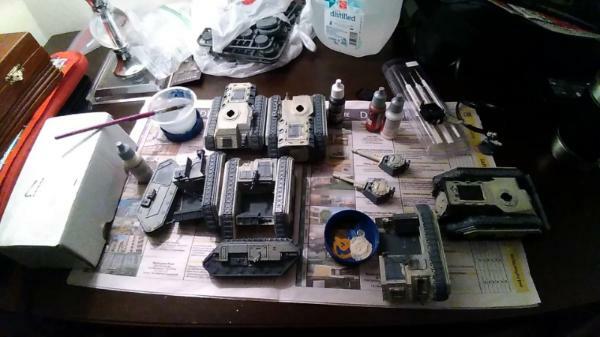 Massive progress on the motorpool this weekend. Still lots of bits and bobs to do, always more, but the end is in sight. The earlier movie discussion really makes me wonder what you want Caged or Chained. Is it Heat? The tanks are looking cool. But space cops need space bikes. Are you going to convert GSC bikes or scout bikes? Textured bases are my new favorite thing in the multiverse. 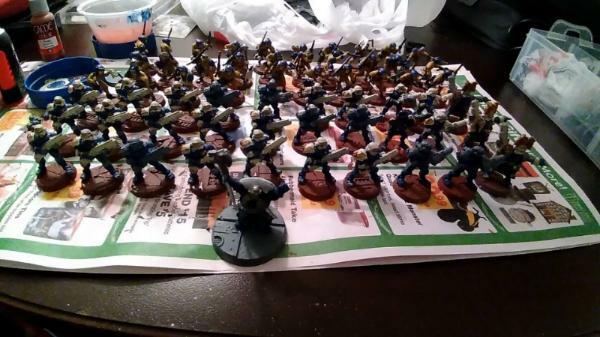 Seriously, I have not even tried to base an army in ten years, and I just did 60 models in a night. 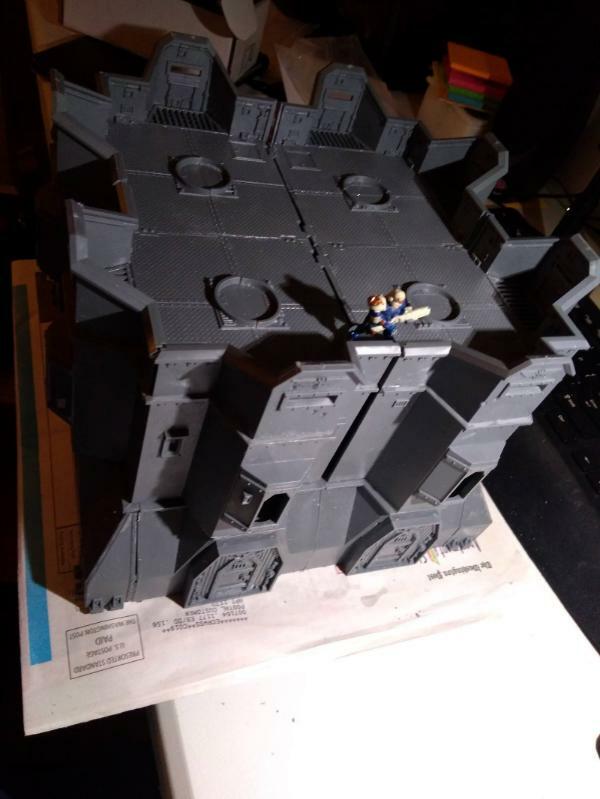 The cages at $5 a pop will make nice scatter terrain or something to put behind a truck. Maybe hang from the Fortress Precinct? Throw some flagellents in and bob's your uncle. Just started watching the 1984 version of Nineteen Eighty Four, I imagine Imperial Law as looking like that one paper but Brazil in practice. The only good rules I might use are Death Riders, in which case I'd use Empire Outriders once of my favorite kits of all time. But I'll have to take a look when the bikes come out. Those bases are not unlike the ones that Studio McVey used for Sedition Wars. For a while, that box was clearancing under $20. Trash all of the game models and print, and just keep the bases and dice, and you came out ahead! Bit of work on some other shelf warmers today, Bullgryns and 10 more Van Saar. Lord have mercy! The soles of his feet are 2 separate parts? Does this accomplish something? I recall Ogres have this too, is there some technical reason? ARE YOU #$^*ing KIDDING me? The CIGAR is a separate bit? That's smaller than a pencil lead! Why? For mercy's sake why? But the results are decent enough. 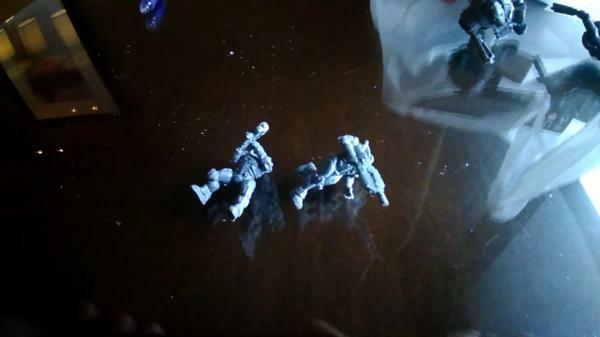 Also starting my second box of Van Saar to Arbites conversions. This one should have some more interesting variations. GW kits are awesome. Really great models but they really don't want you to be creative any more. Conversions are for the truly gifted these days. Funny thing is this wasn't the worst kit I built tonight. The Wonder Twins got a new kitchen set from mom, which meant building it fell to... me. I swear I have built Ikea furniture, GW kits, Russian and Chinese model kits, scratch built stuff but this... this was sent by the Devil himself. 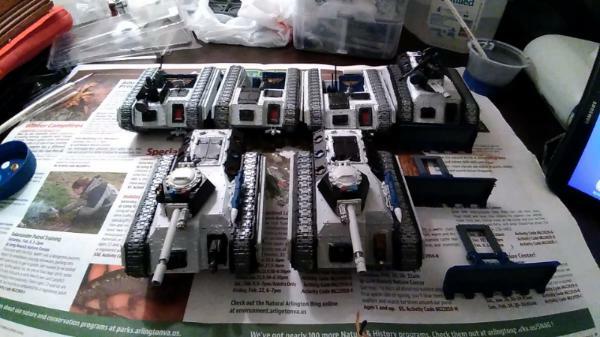 Looking at your Centaurs, I am shocked you didn't just pick up 1/54 scale WWII Universal Carriers and add some 40k bits. 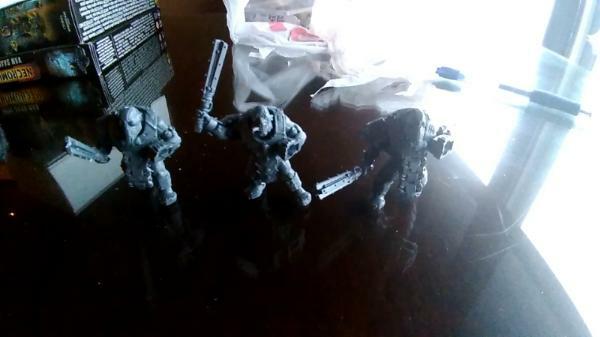 These are $11 on eBay at 1:54 scale, and the Centaurs are pretty much a straight copy of these. Oh. Forgot to say, your stuff looks great though! Really motivating to see that many well converted models. Once I dropped $$$ on OOP Arbites metal I figured I may as well make a GW compliant army. Otherwise I'd have gone with Anvil or Mad Robot who make better and cheaper space cops. 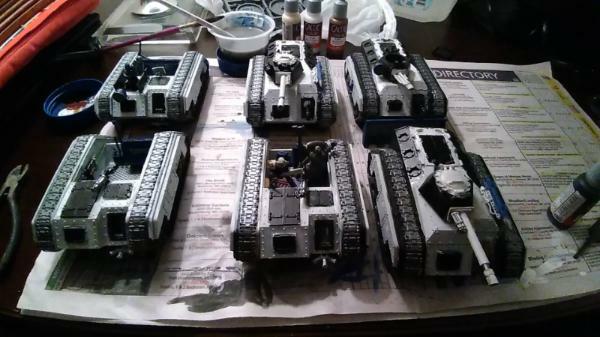 And the Centaurs were about $20 a pop on bitz sites since I just needed the treads and hull. More than fair enough, I can't say anything though... I have spent far more on 20 brand new Tallarn Rough Riders than I would like to admit. I love the old school cool feeling of your army though, I can't wait to see a group shot when it is "done" (because projects like this are never done haha). It is so frustrating when building something and all the screws are different sizes needing differ screwdrivers/heads. It certainly looks like you persevered thought. 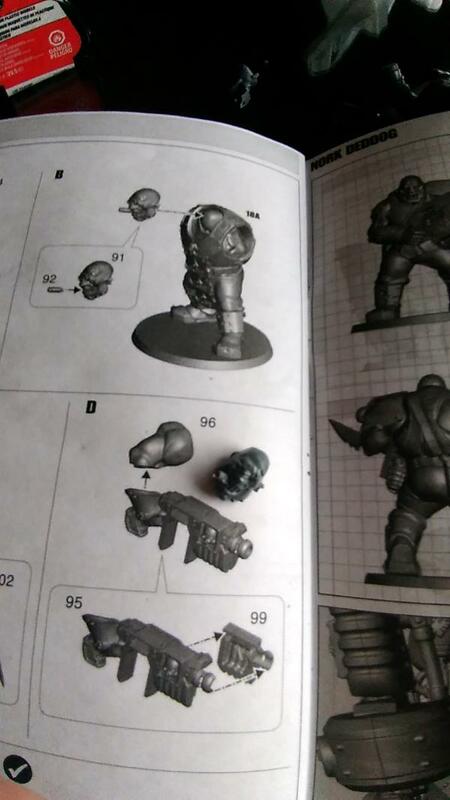 It's a real shame about those model kits allowing no creativity, we wouldn't have gotten to see that cool space hulk if weren't able to be creative. You can fit 4 of them in a Chimera so they're sold in packs of... THREE! The kit has 3 weapon options, 2 shield options and optional suits of armor, and makes a special character! Was all this really necessary? Couldn't they just add some mismatched armor to the base bodies, then have the shields and shoulder pads? Do we really need the ripper guns and grenade gauntlets? It just seems the kit needed a good hard look before they made the sprues, it could easily have had 4 or 5 in the box. Don't get me started on the odd number hotdogs per package versus rolls in a bag! More seriously, in this case it may be an oversight or catch-up on GW's part- they have tried to make a lot of their other IG kits more flexible to get people to keep buying them. 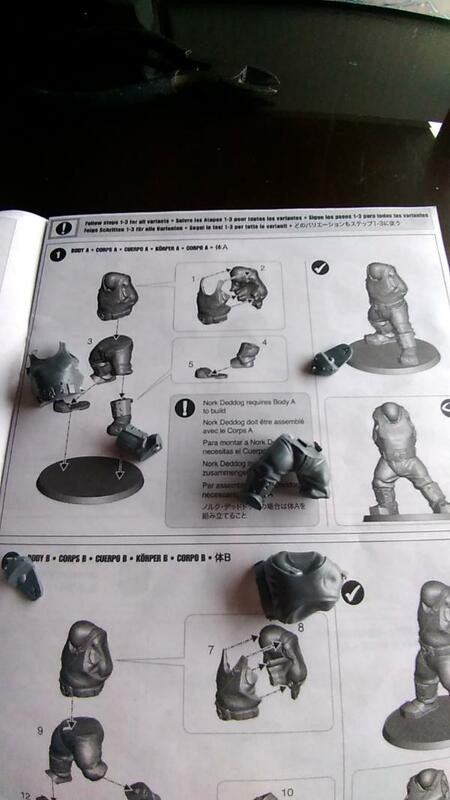 Your ideas are right along those line: instead of having complete specialty figures, have a base figure that you can customize (maybe even magnetize) so you can use those expensive models in multiple roles. Some work on the Chief Justice and some of his associate justices. 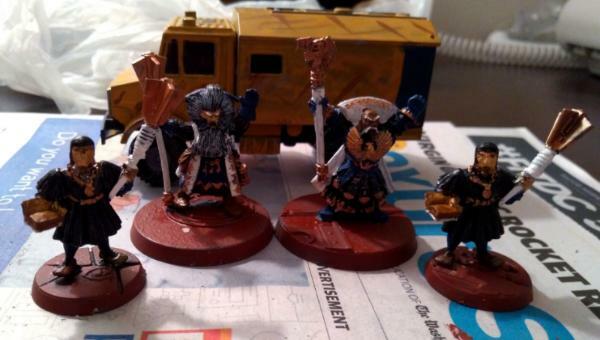 Empire Bright Wizard, Volk or something the high priest, and two old artillery engineers soon to be two officers and two priests. Needs inking but this should work. Also got the Champ Industries bases, as someone said they're a hair bigger than GW bases but fine for my purposes. Should make up an IG squad this weekend to test.